BELOIT — West Branch’s pitching limited Salem to three hits in a 2-0 win over the Quakers on Tuesday in Eastern Buckeye Conference play. Salem falls to 3-5 and 2-3 on the season. David Cunningham went the distance for the Warriors, striking out nine. Brock Hillyer and Mason Walker had RBIs for the winners. West Branch is 5-4, 3-2. Salem hosts West Branch today. 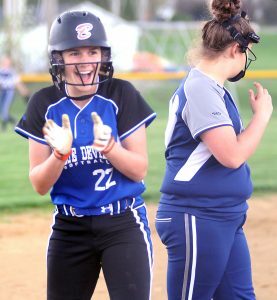 UNITY — Five players had multiple hits as Crestview knocked off Heartland 17-6 in six innings Tuesday. For the Rebels, James Fitzgerald had three hits and four RBIs an Carter Blakeman homered, singled and drove in four runs. Isaac Ricketts singled twice and doubled, Devin Turney doubled and singled and Keith Berger singled twice. Caleb Graft had three hits including a double and two RBIs. Zach Labon added two hits including a double. Devin Sirota had a single and an RBI. Aaron Gault had a single as well. Crestview (8-2) will play at Campbell Memorial today. Heartland (4-2) plays Lowellville at Cene Park today. C–Tyler Hurd, wp (0ER, 5K), Jordan VanPelt (1ER, 5K) and Ketih Berger. HC–Nate Garzanich, lp (3IP, 2K, 5BB), Hayden Stewart (2IP, 2K, 0BB), Tom Kling (1/3IP, 0BB, 0K), Zach Labon (2/3IP, 2K) and Aaron Gault. HANOVERTON — Parker Hydrick had two doubles and three RBIs, while Brady Leyman had a home run and three RBIs as well as a no-hitter on the mound as United beat Leetonia 22-2 in five innings on Tuesday. Wthan Antram added a hit and two RBIs. Gunner McIntosh had two hits and thre RBIs, while Alex Birtalan had a double and three RBIs. UN–Brady Leyman, wp (5IP, 9K, 4BB) and Parker Hydrick. LE–Brock Simpson, lp (1/3IP, 2BB, 1K), Dylan Lennon (1 2/3IP, 7BB, 1K), Brayden Duko (2IP, 0BB, 4K) and Sefton Houlette.